Submitted photo Kerrigan Myers poses with her three medals from the Mansfield Mehock Relays. Myers claimed gold in both the 100-meter hurdles and the high jump and was also part of the Galion squad that ran their way to third place in the 4x100-meter relay on Saturday. MANSFIELD — Galion athletes brought home four championships last weekend from the 87th Mehock Relays at Malabar Middle School. Kerrigan Myers led the Tigers, winning the 100-meter hurdles and high jump at the prestigious meet. Colbey Fox won the 400-meters and Braxton Tate was the best running in the 1,600. Myers, a junior, beat the field in the hurdles with a time of 14.51 seconds. In the high jump, Myers claimed the top-spot on the podium by clearing five feet. In addition to the two championships, Myers — along with Kaitlin Bailey, Jalyn Oswald and Brooklyn Cosey — placed third place in the 4×100-meter relay race, with a time of 51.32 seconds. Fox outlasted the stacked field in the 400-meter dash, claiming gold with a time of 51.84, while Tate ran his way to the title in the 1600-meter in 4:33.76. Tate placed fifth in the 3,200-meter run, with a time of 10:06.04. As a team, the Lady Tigers finished in fifth in the 22-team field, scoring 52.33 points, while the boys were 10th, with 35.20 points. Other placers for Galion were: 800-meter run- Zaynah Tate, 6th and Sari Conner, 7th; 3200- Brooklyn Gates, 4th; 100-hurdles- Samantha Comer, 8th; Pole Vault- Nicole Thomas, tied-8th; Long Jump- Oswald, 4th and Cosey, 7th; Discus- Anna Court, 4th; 4×800-meter relay team of Tate, Ava Smith, Airyona Nickels and Conner, 6th; High Jump- Jack McElligott, 6th and Gage Lackey, tied-8th; Long Jump- Kalib Griffin, 7th; Shot Put- Noah Atkinson, 6th and Colton Yost, 8th; Discus- Atkinson, 7th. LOUDONVILLE — Northmor’s boys squad claimed runner-up honors, among 16 schools, at Saturday’s Cowen Redbird Invitational. The Lady Knights finished seventh. The Knights’ Drew Zoll won the only event championship on the day for either Northmor squad, finishing atop the podium in the 400 with a time of 52.65. Other placements for the boys were: 4×800-relay, 5th; 4×200-relay, 2nd; 4×100-relay, 4th; 4×400-relay, 3rd; 110-meter hurdles- Anthony Petulla, 3rd and Gavin Miller, 8th; 100- Garrett Barnhart, 7th; 1600- Gavvin Keen, 5th and Kooper Keen- 6th; 400- Alec Moore, 6th; 300-meter hurdles- Petulla, 4th and Miller, 7th; 800-meter run- Mostyn Evans, 8th; 200- Zoll, 5th; 3200- Ryan Bentley, 7th; Pole Vault- Tony Martinez, 2nd; High Jump- Blake Miller, tied-5th; Long Jump- Trent Reece, 3rd. Placements for the Lady Golden Knights on Saturday were: 4×800-relay, 3rd; 4×200-relay, 5th; 4×100-relay, 6th; 4×400-relay, 8th; 100-hurdles- Lexi Wenger, 3rd; 1600- Julianna DiTullio, 5th; 400- Sabrina Kelley, 8th; 300-hurdles- Rachael Ervin, 7th and Wenger, 8th; 200- Frankie Cutrupi, 7th; 3200- Olivia Goodson, 7th; Pole Vault- Ervin, tied-8th; High Jump- Lydia Metzger, tied-4th and Reagan Swihart, tied-8th; Long Jump- DiTullio, 5th and Discus- Maddie Jordan, 7th. SANDUSKY — Crestline shot putters Rachel Weyant and Logan Parella won shot put titles Saturday during the St. Mary Central Catholic Larry Fox Memorial Invite. Weyant won the girls shot put with a heave of 31 feet, 11¼ inches. Parrella claimed the boys shot title with a winning mark of 46-feet, 5-inches. Other placements for the Lady ‘Dogs were: 4×200-meter relay, 4th; 4×100-relay, 5th; 400- Caitlin Harley, 5th; 200-meter dash- Holli Garrick, 6th; 3200- Harley, 4th; Discus- Weyant, 2nd and Long Jump- Ivy Stewart, 2nd. Placements for the boys on Saturday were: 100-meter dash- Jaxson France, 6th; 4×200-relay, 2nd; 4×100-relay, 5th; 400- Dakota Wireman, 3rd; 4×400-meter relay, 6th; Discus- Parrella, 4th; Long Jump- Trevor Phillips, 4th and High Jump- Phillips, 6th. CANTON —Colonel Crawford took part in Saturday’s Second Sole Eagle Elite track meet at GlenOak High School. The Lady Eagles would score seven points, good for 20th while the boys snagged eight points and finished 23rd overall. Earning points for the girls were: Katie Ruffener- 5th in the 100-hurdles; Cassidy Vogt- 8th in the 100-hurdles and Drew Krassow- 7th in the high jump. Earning points for the boys team were: Braxton James- 7th in the 800-meter and Alex Mutchler- 3rd in the pole vault. Submitted photo Kerrigan Myers poses with her three medals from the Mansfield Mehock Relays. Myers claimed gold in both the 100-meter hurdles and the high jump and was also part of the Galion squad that ran their way to third place in the 4×100-meter relay on Saturday. 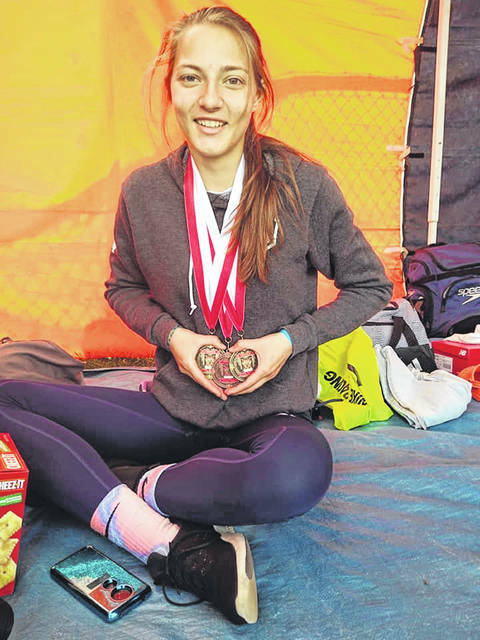 https://www.galioninquirer.com/wp-content/uploads/sites/38/2019/04/web1_Myers-1.jpgSubmitted photo Kerrigan Myers poses with her three medals from the Mansfield Mehock Relays. Myers claimed gold in both the 100-meter hurdles and the high jump and was also part of the Galion squad that ran their way to third place in the 4×100-meter relay on Saturday.